What’s so awesome about olive oil is that it not only tastes great but it’s good for you too. 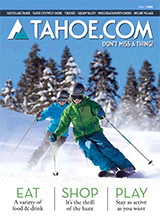 That means that Tahoe Oil and Spice in downtown Truckee has a whole lot of tasty goodness going on. They carry fresh, premium olive oil from the northern and southern hemispheres as well as flavored olive oils infused with savory things like garlic, herbs and much more. You’ll also find balsamic vinegars from Modena, Italy. Look for gourmet treats like organic honey, jams and tapenades alongside spices, rubs and pasta. Pre-made or customized gift baskets are available. Bring your clean and dry empty bottles into the store to get refills. And, yes, Tahoe Oil and Spice has a tasting table.